Here's what I shared with my afterschool groups this month! 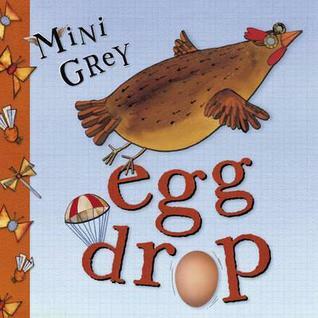 Egg Drop by Mini Grey. Red Fox Books, 2003. The egg was young. If only it had waited. This is the story of an egg who wanted to fly. This book was a hit with both groups this month. It's pretty short and has great pictures (in a large trim size, which is great when sharing with a group). It's also hilarious. The kids particularly liked the pictures of how they tried to put the egg back together again after its drop (sticky tape, string, chewing gum, nails and screws, etc...) and I made sure to read them each caption for those pictures because one of the things they try is tomato soup which looks like blood dripping off the egg (as my first group delightfully noted). 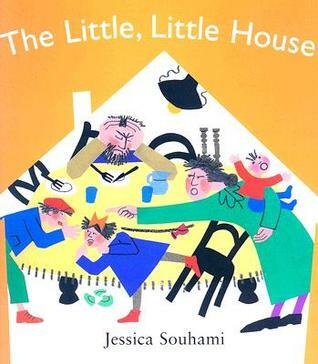 The Little, Little House by Jessica Souhami. Frances Lincoln Children's Books, 2005. This is a retelling of the folktale of a family living in a house that feels too small. The local wise-woman (or, in this case, Aunty Bella) instructs the father to move the chickens into the house, then more the rooster into the house, then move the cow into the house, etc. And finally, when the family turns all the animals out of the house they realize that it's not too small after all. I love this story, but the younger kids in my audience didn't really understand what had happened. I'd probably stick to older elementary kids with this one. That said, everyone delighted in the illustrations showing all the crazy things the animals do inside the house! 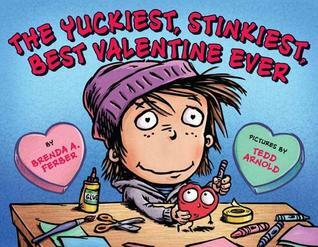 The Yuckiest, Stinkiest, Best Valentine Ever by Brenda Ferber, illustrated by Tedd Arnold. Dial, 2012. As soon as I saw this book come over on our new book cart, I grabbed it for use with the afterschool groups. It's snarky while still showing that Valentine's Day is really about love. It's good for the kids who think V-Day is yucky and for those who enjoy it. And the cartoony illustrations by Tedd Arnold have a ton of kid appeal. Definitely add this one to your school-age rotation! This month's craft was making Valentines, of course, and we kept it simple. We brought white paper and die-cut hearts in pink, purple, and blue. The sites had crayons, scissors, and glue sticks. Three of the sites we visit had visits after Valentine's Day was over, and I spun it with my group by saying I know that Valentine's Day was last week but maybe there was someone they forgot to make a Valentine's Day card for. Or maybe they don't want to make a Valentine's Day card but just a card to show someone they care. The kids were a little disappointed not to have scratch art this month, but I am so sick of scratch art!